I only had a few miles in order to reach Bath, just 12 miles by road according to Google maps. I’d spotted a sign for the Bristol-Bath cycle route near the docks the previous afternoon, and thought it would be easy to pick up this morning. I ended up on the Whitchurch Way, so decided to follow that instead. It was a nice route along a river, then a disused railway line to the village of Whitchurch. From there I went cross country through a couple of small villages, before an ill-advised detour on the A4 took me to Saltford, where I picked up the Bristol-Bath railway path – another old railway line. This was a lovely cycle route, dead flat and it took me into the outskirts of Bath where I picked up the Avon into the city centre. I’d made a bit of a meal out of the journey, turning 12 miles into over 23, but I wasn’t under any time pressure. In fact I’d done so little cycling it was practically a day off. 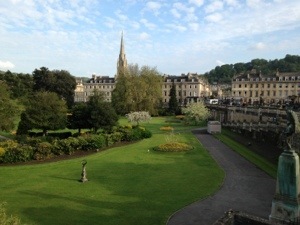 Bath seems very nice, although the price of a Magnum was a little startling at £1.99 – they’ve been £1.60 everywhere else. I’ll come back to you on the price of a pint after a bit of research. You can still donate to cancer research if you haven’t already.